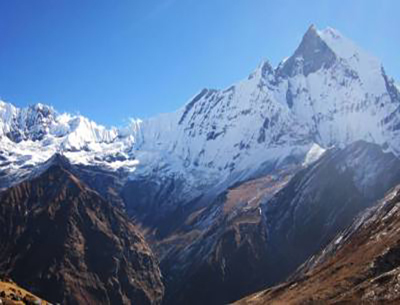 Mardi Himal Trek is one of the most beautiful off-the-beaten-path treks of the gorgeous Annapurna region. Mardi Himal Trek accumulates the best hallmarks of the region encompassing them into a glorious journey, being the trek itself. With paths that intertwine with the Gurung ethnic communities and their unique culture, the trek offers a brilliant opportunity to marvel amid the majestic Himalayas in the Annapurna region. The journey begins from the beautiful lakeside city of Pokhara and moves through the region's off-beaten destinations like Kande and the Siding village. All along the journey, the views of mountain peaks like the Machhapuchhre (6997m), the Mardi Himal (5553m), the Annapurna South (7219m) and the Hiunchuli (6441m) among many other ranges of the Annapurna tower over the deep valleys in the most spectacular manner. Trekkers also get to experience the changing terrain of the region as it changes from alpine to trans-Himalayan landscapes of verdant grasslands, thick woods of rhododendrons and pine acreages into sparse pastures and snowy fields. The Mardi Himal Trek takes trekkers into the more obscure part of the region as it diverts away from the more prominent trail and instead leads to far-off settlements and ethnic villages that are relatively untouched by modernization. Correspondingly, the Mardi Himal Trek is also a great way to experience the region's more naturally verdant and unadulterated natural settings. The journey also presents new perspectives on the Annapurna ranges. Furthermore, the Mardi Himal Trek is also an easy trekking journey. 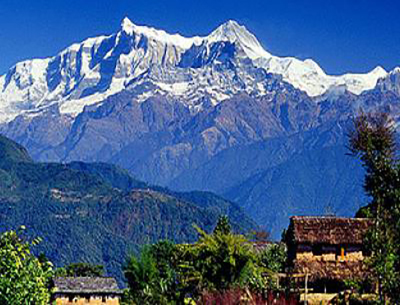 It is a perfect blend of the best-hidden treasures of the Annapurna region. 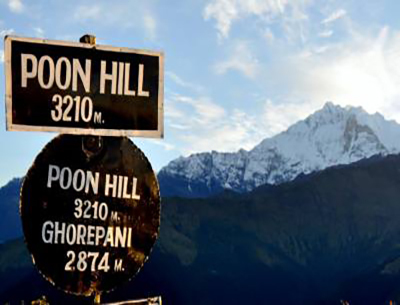 Similarly, the trekking journey is also a good choice for trekkers who want to experience a less-crowded trail. With the mighty Himalayas ready as ever to welcome you to their pristine homes, you are sure to be in awe of their glory while being mesmerized by the hospitality of the local ethnic communities. The Mardi Himal Trek package by Destination Unlimited is an all-rounded trip that is carefully crafted to present our customers with the absolute best services incorporated with the best features of the hidden lands of the Annapurna. Do not miss this amazing opportunity to enjoy the less-trodden path of the gorgeous region with us! Day 01: Arrival at Kathmandu, 1350m. You can arrive in Kathmandu at any time. When you land at the airport, you will be greeted by one of our company's team members who will help you get transferred to your Hotel and will also convey further plans and programs to you about the trip. Overnight stay at the Hotel. Today, you can either fly to Pokhara or decide to have a drive there, as per your convenience. There are daily flights to Pokhara that take about 40 minutes. The drive takes 6 hours through the beautiful countryside of Nepal. Upon arriving at Pokhara, you will be transferred to your Hotel. In the evening, you can enjoy a leisurely boat ride on the pristine Phewa Lake beside the city as well. The views of the Annapurna and the Machhapuchhre Peaks from the city are quite majestic. Overnight stay at the Hotel. Day 03: Drive to Kande1 hr, trek to Forest Camp 2,540m 7-8 hrs. From Pokhara, you will have a drive to the village of Kande. The journey lasts one hour on paved roads that wind beautifully up through the forest and into the hills. Along the way, you will pass by many traditional villages as well. On a clear day, you can see the Machhapuchhre Peak (6997m) also rising above the hills. From Kande, you will then trek further into the thick woodlands and through the valley to reach Forrest Camp. Overnight stay at the guesthouse. From Forest Camp, you will be making your way up the elevation through cedar woods and rhododendron hamlets to High Camp. From here, the view of the Ganesh peak (7422m) and the Annapurna South (7219m) are wonderful. The long narrow Himalayan grasses growing in tussocks in the terrain also make for a trekking adventure that has the feel of a leisurely outdoor hiking in the lap of the Himalayas. Overnight stay at the guesthouse. Day 05: Trek to High Camp 3,590m, 4 hrs. From Low camp, you will make your way to High Camp, enjoying the lush forests and the blue sky decorated with ivory mountain peaks. Along the way, you can come across small huts and houses where the people tend to dry spices on the roofs. Small terrace farms also line the upward-inclined terrain, making the journey quite beautiful. Overnight stay at High Camp. Day 06: Hike up to Upper View Point 4,200m, back to High Camp 4.5 hrs. You will wake up early and can catch the sunrise view as you do so. After that, you will make your way to the Upper View Point, trekking up the ridge and passing through a couple of steeper sections. From the Upper View Point- the panoramic views of the mountain peaks are spectacular; you can get amazing sights of the south face of Annapurna (8091m) and all of the peaks in the Annapurna Sanctuary along with the Hiunchuli Peak (6441m) and the Machhapuchhre (6997m). 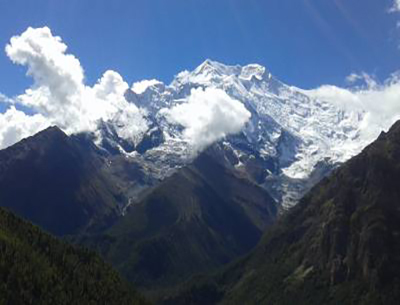 After enjoying the views, you will trek back to High Camp again. Day 07: Trek to Siding Village1280m, 5 to 6 hrs. Siding is a traditional village occupied by ethnic Magar people. It still is very much quieter respite compared to the busier villages of the region. Local homestays are the norm in Siding. It is a wonderful cultural experience where you can enjoy the company of the local people and get to know more about their way of life in the far-off isolated part of the Annapurna region. Overnight at Siding. From Siding, you will make your way back to Pokhara, going through the lush terrain and enjoying the towering mountain peaks. The rhododendron covered woodlands and the scented forests of pine and oaks make the trek a pleasant journey. The terrain is bejeweled with amazing natural vibrancy and a serene atmosphere. Overnight stay at the Hotel in Pokhara. From Pokhara, you will bid the mountains goodbye and make your way back to Kathmandu; once again, it is up to you to decide if you want the journey back via flight or a drive. Upon arriving in the valley, you can opt to spend the rest of the day as you wish. You can stroll around the marketplaces and also shop for gifts and souvenirs. Overnight stay at the Hotel in Kathmandu. Approximately three hours before your scheduled flight, you will be dropped off at the airport from where you will depart.